If you are a diesel vehicle owner, you know that the 2018MOT changes have made the emission standards a lot stricter. You cannot remove the DPF system from your vehicle anymore. Also, you have to service it within the indicated date, or your car will not clear a test. However, now that we have brought our DPF regeneration services in Easington, you won’t have to worry about missing out on service anymore. We are Easington Service Station, one of the largest vehicle service centres in the neighbourhoods of Easington, Saltburn-By-The-Sea and Cleveland. We are here to offer you a one-stop solution to all your vehicle-related issues, including trouble with the Diesel Particulate Filter. Most modern cars will display a fault code if the DPF starts malfunctioning. It will either be in the form of a ‘DPF light’ or ‘EML’ (Engine Management Light). There are also other symptoms that you should keep an eye out for. Look out for a loss of power. Your vehicle will start to deliver poor fuel economy and throttle response. It can fail to start altogether. Diesel engines create a lot more soot than their petrol counterparts. 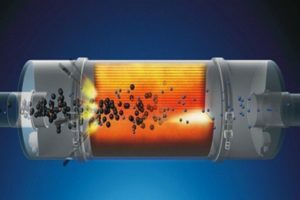 Diesel Particulate Filter, or DPF, is a system that works to reduce the overall pollution coming out of the exhausts. It is often mounted close to the engine for maximum effectiveness. There is a honeycomb structure inside that catches the particulates and releases a cleaner fume. However, this process saturates the inner structure, and the filter loses its effectiveness. If you use the car mostly for small trips around the town, it is more likely to face issues with its DPF. The soot burns away once temperature inside the filter reaches adequate levels. However, that is often not achieved in city traffic. Also, the start-stop traffic in a city like Easington creates more residues as the engine is idling more frequently. If you are driving on the highway, your car will run more efficiently, and the DPF will be in an ideal condition to burn the soot build up. At Easington Service Station, we have facilities for active (increasing the engine output in a controlled way to burn off the soot), passive (where exhaust temperature is hot enough to burn the excess pollutants) and forced (where we overwrite the ECU to burn the residue) regeneration. And the best thing is that we are quick. Our entire service takes about an hour and a half, and you can avail it without burning a hole in your pocket. So, what are you waiting for? Bring your car in and let us prepare it for its next MOT. Didn't pass it in the first place? No worries. We buy MOT failures, lower value cars, and offer general vehicle disposal at affordable rates. Visit us today. We are open from Monday to Friday, 8:30 AM till 5 PM. On Saturdays, we are open till 2 PM.